Only 3 left in stock at this price! 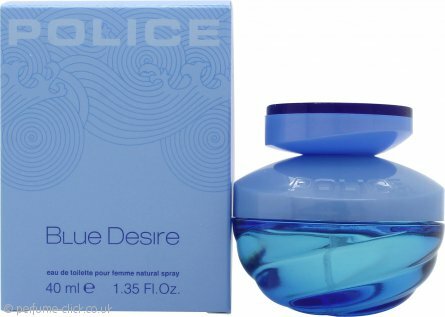 Blue Desire by Police is a fresh, floral and fruity fragrance for women. It contains fresh fruit, citrus, jasmine, rosewood, musk and amber. This is a light, aquatic fragrance is a tribute to the sea. Its shape and depth reminiscent of ocean waves and colors. The fragrance opens with fresh notes of lemon , green leaves and green apple , which then turns into a heart of blooming jasmine and rosewood . The scent closes the warm base notes of cedarwood, amber and musk. An exotic, luxury fragrance.A fragrance that can add colour and sparkle to everyday's life in the city. It leaves you feeling refreshed for a long time.